Misteur Valaire (MV) is an electro-pop(-rock-jazz) group whose members are Sherbrooke natives (Quebec, Canada). Three out of their five members (Drouin, France and To) have known each other since childhood (from the age of 6 when they studied in the music stream at the “l’École Sacré-Coeur” (or “Sacred Heart School”). In elementary school, they had a more generic background in music training before exploring the universe of jazz in high school and meeting Jules. They met Luis from college while attending The College of Sherbrooke and together, delved into electronic music. Their exposure to such formal education was acquired over the years and countless hours of practice, giving them an undeniably solid background in music. In 2004, the group won a music competition (“Musicalarue”, or “Music on the Street”), which allowed them to record a demo. Given the quality of sound and interpretation of this demo, the elder brother of the bassist, Guillaume Déziel, chose to accompany the group in order to produce – from the demo tape their first album, « Mr. Brian ». At the time, his older brother was working for a CD manufacturer that promoted music over the Internet, Postedecoute.ca. On April 26, 2006, Misteur Valaire released its first album “Mr. Brian« , which went unnoticed, as that same day, four other popular French-Canadian artists released an album. And that’s not all! Well-known French-Canadian celebrities united together for a humanitarian cause. Mr. Brian was marketed in a traditional fashion, as in all the albums during that time: public relations, press releases, physical distribution, store positioning, Postedecoute.ca. However, the Misteur Valaire album set itself apart from others with the “Access Privileges” system, the equivalent of Opendisc. Mr. Brian was thus an “elastic album”, with those who had actually purchased the album having a unique code attached to the CD cover. This code allowed them to subscribe to a VIP mailing list and opened a vault to digital content available to buyers of the album premier. Here is an overview of the site of MV at the time. Like most other album firsts in Quebec in the year 2006, Mr. Brian hardly generated in-store sales (300 sold, barely). Since that time, the majority of sales occurred at concerts. Between 2003 and 2009, sales of recordings world-wide fell by over 53%. The iTunes Music Store (iTMS) didn’t hit the Canadian market until December 2004, and Canadian consumers weren’t yet familiar with the legal consumption of MP3 songs during the time that Mr. Brian was launched (April 2006). For that matter, according to IFPI, 95% of original digital music was pirated in 2009, meaning some 40 billion illegally exchanged files. As their 2005 Mr. Brian album was a flop, the group decided to put themselves hard to work and wrote enough material in 2006 and 2007 to release a new album. These original compositions were performed in front of a loyal audience at their premier show. A few of those new songs had been recorded as a demo and as always, first presented to album buyers of Mr. Brian, through Privilege Access. It’s estimated that MV had at least 1,000 fans at that time. These fans could enjoy a Creative Commons License (by-nc-sa 2.0), and reproduce/remix the contents of the album as their hearts so desired. Faced with this total flop (a common occurrence for most of the artists at the time), Misteur Valaire chose to take a complete turnaround by going digital in September of 2007. One question haunted them: What good would spending money making CDs do when people are buying fewer and fewer CDs, especially when the songs can be found on the web for free? 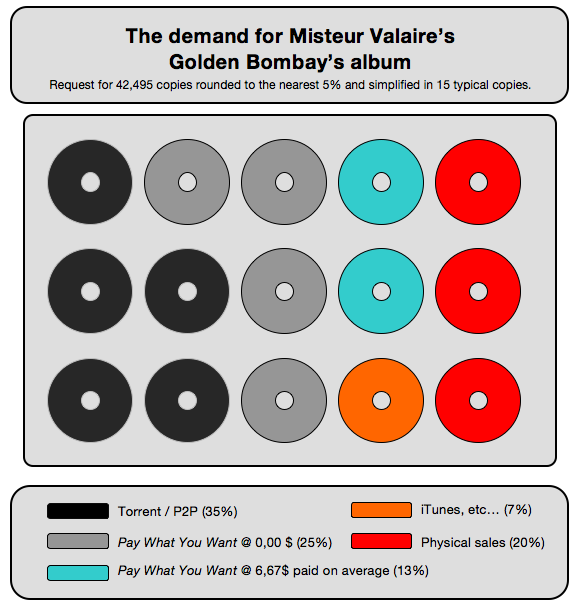 The idea of trading the next Misteur Valaire album with the fans’ emails seemed more and more logical: The choice between having their MP3 music swiped anonymously (and subsequently getting advertising to communicate to its fans), or having the possibility of downloading their music free and communicating to their fans… was easy to make. But, at that point, MV didn’t yet have the popularity necessary to require fans to give their precious emails in exchange for the next album. In September 2007, one month before the revolutionary release of Radiohead’s album In Rainbow (formerly Pay What You Want), Misteur Valaire released its album entitled “Friterday Night” under the license Creative Commons (by-nc-sa 2.0), while taking care of giving away its music without any psychological barrier: no name field to input, email, nor credit card number to enter. Nothing whatsoever. Like a “hit and run” without the ambush. Rapidly, the number of downloads reached 5,000 (in November 2007), then went to 10,000 (in March 2008), then 15,000 (in June 2008), 20,000 in September 2008, 25,000 (in December 2008), then 30,000 (in March 2009). Surely without the imposter syndrome, MV decided to impose people to provide their emails as of the 27,000th download. And, since the demand for MV’s music was starting to gain “sexiness”, it became easier to convince a record distributor to market a hard copy of the album that was “hacked” 27,000 times. In fact, in November 2008, only 10% of its pirate-downloading fans of the album Friterday Night would have had to buy the physical album in stores, to convince a distributor to add the product to its catalogue. Thus, MV signed a distribution contract with Fusion 3 who, wrought with misfortune, filed for bankruptcy two weeks later, in December 2008. Nevertheless, Outside Music opened out its arms to MV in February 2009. The official physical version of the album Friterday Night was selling in stores in March 2009 (18 months after its launch in 2007), with average sales of 14.6 copies per week, 1,287 “Soundscan” copies sold within 22 months, mainly in the province of Quebec. In December 2009, the number of downloads was reaching near 40,000 copies, the magic number for a Golden Record in Quebec. But since these 40,000 copies weren’t “paid for”, they couldn’t expect the ADISQ to award them a trophy! It was at that moment that MV concocted their first home-made Golden Record. At the time, a few people classified MV’s marketing strategy as being “suicidal”. Obviously, those who knew the good years of 1990 when it was easy to sell 50,000 copies couldn’t believe how MV was wasting away potential earnings on their music, as well as the value of the music itself by giving it away freely. However, if MV gave up the profits related to its music sales in the short term (as long as selling CD’s are still profitable! ), MV would have also given up humungous promotional expenditures in the medium and long term. Back in the days of the “Golden Record age, you’d have to spend $80,000 in advertising in order to reach 40,000 actual album buyers. MV can presently count having 25,000 people who consume their music, according to their fan mailing list – that’s 25,000 who want to hear about what’s happening with MV. Moreover, it costs MV $0 today to talk to “upon desire” to 25,000 of their consumer-fans. That’s not including the fact that each one of their fans is “geo-positioned” on the world map (at roughly 10 km2). In September 2009, MV already had 3,500 fan downloaders in France, mainly in Paris. Encouraged by these stats, the group tried their first tour across the Atlantic in response to this French market. From September 4th to 16th, 2009, MV made their first stint in France (Off-Court de Trouville, Plage Glazart in Paris, The Batofar (a boat transformed into a concert room) and the Paris International. 300 people filled the Batofar, for a concert that was also a showcase for the Parisian music industry. It was at this time that the relationship between MV and their French show manager, Furax, was formed. Cost of event promotion: $0. Mailing list, Facebook messages, a helping hand from Lucile, a friend from Social Network Strategy in Paris. Overall, a success taking into account the investment. Check out a small video souvenir of our first show in France. In December 2009, MV released a pre-sale operation for their next album by adopting a strategy similar to Quebecer singer Richard Desjardins. This singer registered his first solo record in 1988, “Les derniers humains”, financed by the pre-sale of 1,000 copies at $10 per copy. Inspired by Desjardins, MV called out to its fans to purchase – before releasing to the public – the album Golden Bombay – to appear in May 2010. 629 fans pre-bought the album online at a nominal cost of $35, which included an MP3 version of the album received 2 weeks before its release, an invitation to the opening show at Club Soda, as well as a hard copy of the CD the evening of the show. This operation allowed MV to collect $22,000 before the album release. In May 2010, at the time where the album Friterday Night had more than 45,000 copies given (in which 18,000 were given in exchange for the downloader’s email address), MV released its 3rd album, entitled Golden Bombay. This time, Indica joined in the adventure with MV as co-publisher, with the goal of increasing the diffusion of the album, as much nationally as on the international scale. Upon Indica’s request, MV moderated its strategy of “giving away” its music and adopting the “Pay What You Want” model, in which Radiohead had shown great results since October 2007. Thereby, MV enjoyed the best of both worlds: selling and offering music for free. It was obviously useless in attracting downloaders to obtain Golden Bombay in the Web’s black holes (P2P, Torrents, etc.). To sell the album at any price would have inevitably sent those not wishing to purchase the music on anonymous file-sharing systems. This would have deprived MV from obtaining the precious email addresses from its downloaders (a.k.a. “pirate-fans”). The Pay What You Want model quickly generated fascinating results. Contrary to Radiohead, MV chose to publish its download statistics in 2010 with full transparency, through its manager’s blog. Moreover, it was noted that 1/3 of downloaders chose to pay an average of $7.07, whereas the value drops to $2.36 when the sums are averaged out as a whole (including the 2/3 of people who don’t pay). We also noticed that the perceptive value of Golden Bombay declined in relation to the date of the album release; true fans attribute more value to MV music. On the other hand, curious passers aren’t ready to spend money on music that they’ve never heard before. These listeners become, for the most part, new fans who would not have necessarily paid to discover MV. In all cases, the email addresses of download fans, as well as their IP addresses (geographic location) are reaped, allowing the group to maintain a privileged relation with its fans. It’s through this means that MV could conclude that Golden Bombay was downloaded across more than 58 countries. Looking at the 42,495 copies demand for the Golden Bombay album, we conclude that 35% will be downloaded from the Torrent / P2P sharing networks. However, 25% will be downloaded through MV’s “Pay What You Want” system at $0 and 13% at a chosen price averaging $6,67. Also, 7% will be downloaded through iTunes and other similar online music stores, and 20% (hard copies) will be bought in stores and at concerts. Mr. Label, the company behind MV, has 8 associates: 5 musicians and 3 support staff – a sound engineer/album co-producer/concert projectionist (VJ), a lawyer/administrative professional and a marketing professional/publisher/business developer. The latter three form a support team for the artists and, with the five musicians, are co-producers for all MV albums. The profits from MV are shared in equal parts between all the shareholders of the company. The core team is surrounded by several resource people. In total, more than 22 people work for MV: a loyal employee and several contractors, including: a booking agent, concert producer, video producer, stage designer/director, stylist, after-party event coordinator, public relations specialist, soundman, lighting designer, lighting operator, band gear, tour manager, co-editors and sub-editors, etc. Since the album release of Golden Bombay, sales revenues of the album (pre-sale, store sales and Pay What You Want on the Internet) were evaluated at more than $73,000. Since the beginning of its activities in 2005, MV has always reinvested its revenues into its own activities, allowing it to record its albums and pre-produce its concerts which have been acclaimed by critics. It’s only been since September 2009 that the eight associates have been able to earn a salary. Though still a modest salary, it’s still enough to allow them to dedicate themselves 100% to their project. When MV made its first Montreal appearance at the Metropolis on October 20th, 2010, the group generated enough revenue to make it profitable. To do so, MV orchestrated a press relation campaign and only spent $321 in advertising on Facebook to succeed in filling up the Metropolis. Most of the 2,200 people present at the show were invited to purchase their tickets by email and by Twitter and Facebook notifications. This operation was such a success that MV decided to announce a supplementary show at the Metropolis on February 17th, 2011. This supplementary show was also sold out. In 2007, MV grossed $28.2K, with 80% generated from concerts. Since then, this value has grown by 709%. 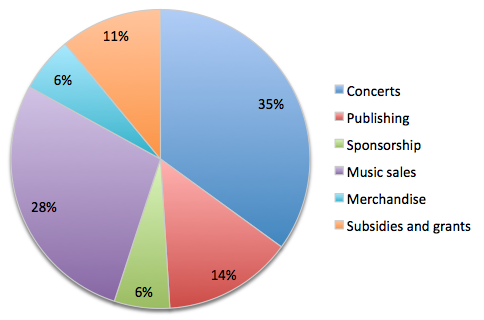 It’s conferred as being 35% from concerts, 14% from exploitation of copyright (film, ads, radio airplay), 6% from sponsors, 28% from music sales and 6% from merchandising. Today, MV is supported by public funds at 24% (32% in 2009, 38% in 2008 and 19% in 2007). MV invites you to check their first iPhone application, their video game, as well as their 360˚ spherical video. Also, when MV made a call to filmmakers to film their live concert at the Metropolis last October 20, 2010, 45 filmmakers responded. MV has compiled a video montage of the various video clips submitted. More recently, a mocumentary about the participation of MV at the Montreal International Jazz Festival has been produced. You can catch a glimpse of this televised show (30 min. ), revealing the behind-the-scenes preparation and the production of a Great FIJM Event, where the group performed in front of 100,000 people!